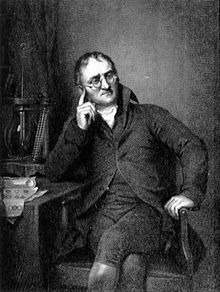 John Dalton (September 6, 1766 – July 27, 1844) was an English chemist and physicist, born at Eaglesfield, a small town near Cockermouth in Cumbria. He grew up as a Quaker, never married, and devoted his life to teaching, research, and practicing his faith. Dalton is best known for his formulation of the atomic theory, which clarified our understanding of how atoms combine to form compounds, and how atoms may form new combinations during chemical reactions. He thus laid a firm foundation for the development of modern chemistry, and he is widely regarded as one of the giants of science. Eaglesfield, the place of Dalton's birth, was a small town with a significant population of Quakers. His father Joseph (who made a meager living as a weaver) and mother, Deborah Greenup Dalton, were Quakers. This background may have influenced him to seek reasonable explanations for natural phenomena beyond the authoritarian pronouncements of established church doctrines. Due to his family's economic situation, Dalton had to work on local farms to supplement their income. Dalton's interest in science was encouraged by a wealthy neighbor, Elihu Robinson (also a Quaker), who was a competent amateur scientist and instrument maker. John's elder brother, Jonathan Dalton, found a teaching position in the nearby town of Kendal in the Lake District. The younger brother was invited to come along and try his hand at teaching as well. It seemed a happy opportunity, as it would allow him to pursue his interests at the same time as earning a living. Thus the future scientist became, at age 15, an elementary school teacher. Kendal was a larger town and allowed Dalton many opportunities, including exposure to leading figures in the scientific and mathematical world. John Gough, who at that time was giving public lectures on subjects including meteorology and chemistry, became Dalton's mentor, teaching him Latin, Greek, French, and mathematics. Gough was a well-known academician and promoter of natural science, and his influence played an important role in Dalton's career. During his years in Kendal, Dalton contributed solutions of problems and questions on various subjects to the Gentlemen's and Ladies' Diaries, and in 1787 he began to keep a meteorological diary in which, during the succeeding 57 years, he entered more than 200,000 observations. His first separate publication was Meteorological Observations and Essays (1793), which contained the seeds of several of his later discoveries. Another work, Elements of English Grammar, was published in 1801. In 1794, Dalton was elected a member of the Manchester Literary and Philosophical Society (the Lit & Phil). A few weeks after election, he communicated his first paper, “Extraordinary Facts Relating to the Vision of Colours,” in which he postulated that shortage in color perception was caused by discoloration of the liquid medium of the eyeball. In fact, a shortage of color perception in some people had not even been formally described or officially scientifically "noticed" until Dalton wrote about his own symptoms. Although Dalton's theory lost credence in his own lifetime, the thorough, methodical nature of his research into his own visual problem was so broadly recognized that “Daltonism” became a common synonym for color blindness. That part of the image which others call red appears to me little more than a shade or defect of light. After that the orange, yellow and green seem one colour, which descends pretty uniformly from an intense to a rare yellow, making what I should call different shades of yellow. This paper was followed by many others on diverse topics on rain and dew and the origin of springs, on heat, the color of the sky, steam, the auxiliary verbs and participles of the English language, and the reflection and refraction of light. 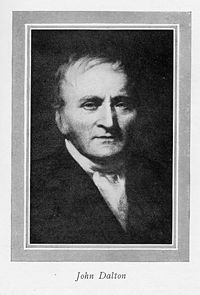 In 1800, Dalton became a secretary of the Manchester Literary and Philosophical Society, and in the following year he presented an important series of papers, entitled Experimental Essays, on several topics: the constitution of mixed gases; evaporation; the thermal expansion of gases; and the pressure of steam and other vapors at different temperatures, both in a vacuum and in air. There can scarcely be a doubt entertained respecting the reducibility of all elastic fluids of whatever kind, into liquids; and we ought not to despair of affecting it in low temperatures and by strong pressures exerted upon the unmixed gases further. After describing experiments to ascertain the pressure of steam at various points between 0° and 100 °C (32 and 212 °F), he concluded from observations on the vapor pressure of six different liquids, that the variation of vapor pressure for all liquids is equivalent, for the same variation of temperature, reckoning from vapor of any given pressure. I see no sufficient reason why we may not conclude that all elastic fluids under the same pressure expand equally by heat and that for any given expansion of mercury, the corresponding expansion of air is proportionally something less, the higher the temperature. It seems, therefore, that general laws respecting the absolute quantity and the nature of heat are more likely to be derived from elastic fluids than from other substances. He thus enunciated Gay-Lussac's law, stated some months later by Joseph Louis Gay-Lussac. In the two or three years following the reading of these essays, he published several papers on similar topics, that on the absorption of gases by water and other liquids (1803), containing his law of partial pressures, now known as Dalton's law. The most important of all Dalton's investigations are those concerned with the atomic theory in chemistry, with which his name is inseparably associated. It has been proposed that this theory was suggested to him either by researches on ethylene (olefiant gas) and methane (carburetted hydrogen) or by analysis of nitrous oxide (protoxide of azote) and nitrogen dioxide (deutoxide of azote), both views resting on the authority of Thomas Thomson. However, a study of Dalton's own laboratory notebooks, discovered in the rooms of the Lit & Phil, concluded that the idea of atomic structure arose in his mind as a purely physical concept, forced upon him by studying the physical properties of the atmosphere and other gases. He realized that chemical combination consists of the interaction of atoms of definite and characteristic weight (or definite proportions). Why does not water admit its bulk of every kind of gas alike? This question I have duly considered, and though I am not able to satisfy myself completely I am nearly persuaded that the circumstance depends on the weight and number of the ultimate particles of the several gases. He proceeds to give what has been quoted as his first table of atomic weights, but in his laboratory notebooks there is an earlier one dated 1803 in which he sets out the relative weights of the atoms of a number of substances, derived from analysis of water, ammonia, carbon dioxide, and so forth by chemists of the time. It appears, then, that confronted with the problem of calculating the relative diameter of the atoms of which, he was convinced, all gases were made, he used the results of chemical analysis. Assisted by the assumption that combination always takes place in the simplest possible way, he arrived at the idea that chemical combination takes place between particles of different weights—a concept that differentiated his theory from the historic speculations of the early Greeks. In attempting to understand how atoms may combine with one another, Dalton took into account the law of definite proportions, expressed by French chemist Joseph Proust. According to this law, the combining of chemical elements to form compounds takes place in certain well-defined proportions, rather than mixing in just any proportion. Careful study of the actual numerical values of these proportions led Dalton to propose his law of multiple proportions, which was confirmed by experimentation. These laws became important steps toward his formulation of the atomic theory. Dalton hypothesized the structure of compounds can be represented in whole number ratios. So, one atom of element X combining with one atom of element Y is a binary compound. Furthermore, one atom of element X combining with two elements of Y or vice versa, is a ternary compound. Dalton used his own symbols to visually represent the atomic structure of compounds. These were published in his chemistry text, New System of Chemical Philosophy (1808), in which he listed a number of elements and common compounds. Many of those compounds were listed correctly, but others were not. Dalton acquired many of his ideas from the work of other chemists, including Antoine Lavoisier and William Higgins. He, however, was the first to put the ideas into a universal atomic theory, which was undoubtedly his greatest achievement. The atoms of a given element are different from those of any other element. Unfortunately, Dalton had an additional statement that prevented his theory from being accepted for many years: “When atoms combine in only one ratio...it must be presumed to be a binary one, unless some cause appear to the contrary." Dalton had no evidence to support this statement from his theory and it caused him to wrongly assume that the formula for water was OH and ammonia was NH. As a result, Dalton's experimental data did not support many of the conclusions he drew from it. Amazingly, all but two of the statements in his atomic theory are still believed to be true by scientists today. The statement that "atoms cannot be subdivided, created, or destroyed into smaller particles when they are combined, separated, or rearranged in chemical reactions" is inconsistent with nuclear fusion and fission reactions, but these processes are nuclear reactions, not chemical reactions. In addition, the statement that "all atoms of a given element are identical in their physical and chemical properties" is not precisely true, as different isotopes of an element have varying numbers of neutrons in their nuclei, though the number of protons remains the same. 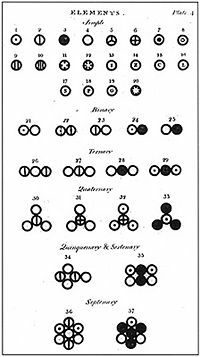 Dalton communicated his atomic theory to Thomson who, by consent, included an outline of it in the third edition of his System of Chemistry (1807), and Dalton gave a further account of it in the first part of the first volume of his New System of Chemical Philosophy. The second part of this volume appeared in 1810, but the first part of the second volume was not issued till 1827, though the printing of it began in 1817. This delay is not explained by any excess of care in preparation, for much of the matter was out of date and the appendix giving the author's latest views is the only portion of special interest. The second part of the second volume never appeared. Dalton was president of the Lit & Phil from 1817 until his death, contributing 116 memoirs. Of these, the earlier ones are the most important. In one of them, read in 1814, he explains the principles of volumetric analysis, in which he was one of the earliest workers. In 1840 a paper on the phosphates and arsenates, often regarded as a weaker work, was refused by the Royal Society, and he was so incensed that he published it himself. He took the same course soon afterwards with four other papers, two of which (“On the Quantity of Acids, Bases and Salts in Different Varieties of Salts” and “On a New and Easy Method of Analysing Sugar”) contain his discovery, regarded by him as second in importance only to the atomic theory, that certain anhydrates, when dissolved in water, cause no increase in its volume. His inference was that the salt enters into the pores of the water. As an investigator, Dalton was content with rough and inaccurate instruments, though better ones were readily attainable. Sir Humphry Davy described him as "a very coarse experimenter," who almost always found the results he required, trusting his head rather than his hands. In the preface to the second part of the first volume of his New System, he says he had so often been misled by taking for granted the results of others that he determined to write "as little as possible but what I can attest by my own experience." Yet he carried this independence so far that it sometimes resembled lack of receptivity. Thus he distrusted, and probably never fully accepted, Gay-Lussac's conclusions as to the combining volumes of gases. He held peculiar and unfounded views about chlorine. Even after its elementary character had been settled by Davy, he persisted in using the atomic weights he himself had adopted, even when they had been superseded by the more accurate determinations of other chemists. He always objected to the chemical notation devised by Jöns Jakob Berzelius, although by common consent it was much simpler and more convenient than his own cumbersome system of circular symbols. His library, he was once heard to declare, he could carry on his back, yet reputedly he had not read half the books it contained. Before he had propounded the atomic theory, he had already attained a considerable scientific reputation. In 1804, he was chosen to give a course of lectures on natural philosophy at the Royal Institution in London, where he delivered another course in 1809–1810. However, he was deficient, it would seem, in the qualities that make an attractive lecturer, being harsh and indistinct in voice, ineffective in the treatment of his subject, and singularly wanting in the language and power of illustration. In 1810, he was asked by Davy to offer himself as a candidate for fellowship of the Royal Society but declined, possibly for financial reasons. However, in 1822 he was proposed without his knowledge, and on election paid the usual fee. Six years earlier, he had been made a corresponding member of the French Académie des Sciences, and in 1830 he was elected as one of its eight foreign associates in place of Davy. In 1832, he was awarded a doctorate degree at Oxford University. In 1833, Lord Grey's government conferred on him a pension of £150, raised in 1836 to £300. Dalton never married and did not have many friends throughout his life. He lived for more than a quarter of a century with his friend, the Rev. W. Johns (1771–1845), in George Street, Manchester, where his daily round of laboratory work and tuition was broken only by annual excursions to the Lake District and occasional visits to London. In 1822, he paid a short visit to Paris, where he met many distinguished resident scientists. He attended several of the earlier meetings of the British Association for the Advancement of Science at York, Oxford, Dublin, and Bristol. Dalton died of paralysis in Manchester in 1844. The first attack he suffered in 1837, and a second in 1838 left him with a speech impediment, though he remained able to conduct experiments. In May 1844, he had another stroke; on July 26 he recorded with trembling hand his last meteorological observation, and on July 27 he fell from his bed and was found lifeless by his attendant. A bust of him, by Chantrey, was publicly subscribed for him and placed in the entrance hall of the Manchester Royal Institution. Dalton had requested that his eyes be examined after his death, in an attempt to discover the cause of his colorblindness; he had hypothesized that his aqueous humor might be colored blue. Postmortem examination showed that the humors of the eye were perfectly normal. However, an eye was preserved at the Royal Institution, and a 1990s study on DNA extracted from the eye showed that he had lacked the pigment that gives sensitivity to green; the classic condition known as a deuteranope. In honor of his work with ratios and chemicals that led to the idea of atoms and atomic weights, many chemists and biochemists use the unit “Dalton” (abbreviated Da) to denote one atomic mass unit, or one-twelfth the weight of a neutral atom of carbon-12. ↑ Henry E. Roscoe and Arthur Harden, A New View of the Origin of Dalton's Atomic Theory The Sources of Science, no. 100 (1896; New York: Johnson Reprint Corp., 1970). ↑ The law of definite proportions may be stated as follows: When elements combine to form compounds, they do so in definite proportions to one another, by mass. ↑ The law of multiple proportions may be stated as follows: If two chemical elements can form more than one compound between them, then the masses of one element that combine with a fixed mass of the other element will be ratios of small whole numbers. For example, if one considers the combining of carbon and oxygen atoms to form CO and CO2, the ratio of oxygen in CO to oxygen in CO2 is 1:2. ↑ Roscoe & Harden, 50-51. Dalton, John. 1964. A New System of Chemical Philosophy. The Science Classics Library. New York: Philosophical Library. Henry, William Charles. 1854. Memoirs of the Life and Scientific Researches of John Dalton. London: Harrison. Hunt D. M., K. S. Dulai, J. K. Bowmaker, and J. D. Mollon. 1995. The Chemistry of John Dalton's Color Blindness. Science 267 (5200): 984-988. Roscoe, Henry E., and Arthur Harden. 1970. A New View of the Origin of Dalton's Atomic Theory. The Sources of Science, no. 100. New York: Johnson Reprint Corp.
Smith, Robert Angus. 1856. Memoir of John Dalton: and History of the Atomic Theory up to his Time. London: H. Bailliere. This page was last modified on 25 August 2016, at 18:13.